Since 1937, Numerica Credit Union has been a part of our members' lives and has strived to be an asset to the communities that we serve. Right from the start, Numerica has kept a razor-sharp focus on improving and expanding service for our members, and what a journey it has been. We've forged our members-first philosophy into a reputation as one of the area's leading financial institutions by providing sustained quality service. Numerica is different from other financial institutions because we exist solely to serve our membership. As a locally-managed, member-owned, not-for-profit financial cooperative, Numerica is dedicated to the philosophy of ''people helping people.'' We believe that we have a responsibility to help the communities we serve become better places to live. We are involved in community service, not because we have to, but because we want to. Our goal is to make a difference in people's lives. Numerica ensures that quality financial products and services are available to all people in all walks of life. We're here to help the little guy buy his first home, retire comfortable, or start his own business. Numerica Credit Union currently has over 90,000 members throughout Central and Eastern Washington and Northern Idaho and over $1 billion in assets. Numerica has 17 branches that offer a full line of financial products and services, including mortgages and business services products. Membership is open to anyone who lives or works in the State of Washington or the Idaho Panhandle. 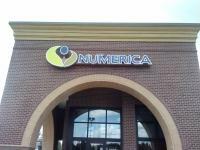 Numerica is located on Highway 95, just north of Appleway, next to Fred Meyer.